Vidyut Sahayak (Junior Assistant):Graduate (Regular) in any discipline from recognized University with –60% or more marks in final year (or last two semesters) exam (first trial without ATKT) for General Category (UR) and,55% or more marks in final year (or last two semesters) exam (first trial without ATKT) for Reserved Category candidates (SC/ST/SEBC). Deputy Superintendent of Accounts :C.A. / I.C.W.A. / M.Com. / M.B.A. (Finance) in regular mode from recognized University / Institute without ATKT in final year. Application Fee: Candidates have to pay of Rs. 500/- for General (UR) / SEBC / PH Candidates & Rs. 250/- for SC / ST Candidates through challan at any branch of State Bank of India. How to apply: Interested candidates can apply online through website www.pgvcl.com. Candidates are requested to take the print out of the filled up application and to submit the same with the photocopies of all relevant documents & two passport size photograph to given below address by RPAD / Speed Post. Note: It is compulsory to mention the generated Application Number & to write “Application for the post of Vidyut Sahayak (Junior Assistant)” on the envelop. Send your application at here: I/c. 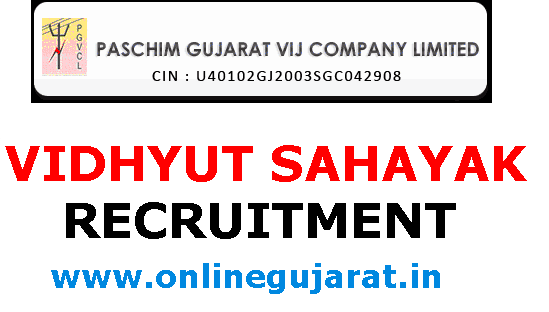 General Manager (HR), Paschim Gujarat Vij Company Limited, Regd. & Corporate Office, “Paschim Gujarat Vij Seva Sadan”, Nana Mava Main Road, Laxminagar, Rajkot – 360 004.